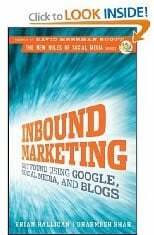 We recommend "Inbound Marketing: Get Found Using Google, Social Media, and Blogs", by the founders of HubSpot, Brian Halligan and Dharmesh Shah. Inbound marketing is nothing less than a sea change in the way we market our businesses. It's driven by consumers who want to reach out and touch us, rather than the other way around. Using the Internet as a primary vehicle, inbound marketing gives us the means to attract new customers without blasting them with advertising and endless e-mail promotions. Instead, we build relationships first, like we used to do prior to mass marketing. The only difference is that we do it online with social networking and publishing great content in our blogs and videos. The HubSpot founders have been on top of this trend since day one, and this book delivers the best rationale for inbound marketing I have seen, plus lots of excellent how-to details. I am recommending it to all of our clients and friends. Click here to read about our approach to inbound marketing and our inbound marketing services.